Course Report is pleased to present our fourth Market Sizing Report, another in-depth, empirical study that takes stock of the coding bootcamp industry. Course Report polled every full-time, in-person US/Canadian bootcamp with courses in web and mobile development, gathering statistics on 2016 graduates and projected 2017 graduation rates. Our response rate was once again impressive: 98% of schools responded. This year marks the 5th anniversary for the coding bootcamp industry, and the number of coding bootcamp graduates has grown 10x since the first bootcamps launched in 2012. Coding bootcamps are a $260 million industry and will graduate ~23,000 developers in 2017. In 2017, the bootcamp market will grow by 1.5x, to an estimated 22,949 graduates in 2017, up from 15,077 in 2016. In 2017, the number of bootcamp providers has grown to 95, compared to 91 last year. (This accounts for 15 new schools and 6 closed schools). We estimate that tuition revenue from qualifying US schools will be $266M in 2017, excluding scholarships. As of June 1, there are coding bootcamps in 74 US cities and 40 states! 1 We estimated undergraduate CS graduates by using the 2016 Taulbee Study, published by the CRA (http://cra.org/crn/wp-content/uploads/sites/7/2017/05/2016-Taulbee-Survey.pdf ) The Taulbee Study is a survey of PhD-granting departments, released annually in May. The National Center for Science and Engineering Statistics compiles statistics on undergraduate degrees but hasn’t published statistics since 2011. We assumed that Taulbee captured 26% of the total undergraduate degrees, based on the most recent comparison published at http://cra.org/crn/2012/11/counting_computing_cra_taulbee_survey_and_nsf_statistics. Only two schools refused to participate in the study: Code Tahoe and Cleveland Codes. Two schools, Coder Foundry and Omaha Code School, participated in our 2016 report but failed to respond in 2017. The industry growth rate was applied to reported 2016 graduates. To establish an “Industry Growth Rate,” we calculated the growth rate from 2016-2017 of actual reported graduates for a growth rate of 57%. We only included schools who fully participated in both 2016 and 2017. 15 bootcamps are not included in the 2017 study which were included in 2016, for a variety of reasons. Schools that are now online only or no longer teach full-time coding courses: The Tech Academy, Think Academy, Tradecraft, Softstack Factory. RefactorU, Silicon Stem Academy, Guild of Software Architects, Coding House, CodeMasters Academy, Code Builders, are closed. 2 Coder Foundry participated in our 2016 report but failed to respond in 2017. The industry growth rate was applied to reported 2016 graduates. 3Dev Bootcamp is expected to close in December 2017. 4Omaha Code School participated in our 2016 report but failed to respond in 2017. The industry growth rate was applied to reported 2016 graduates. 5The Iron Yard is expected to close in November 2017. Inclusion Criteria. To qualify for inclusion in the survey, a school must (a) offer full-time, in-person instruction of 40 or more hours of classroom time per week, (b) not be degree-granting through an accredited college or university, (c) provide coding-specific curriculum with a focus on Full-Stack Web Development, Mobile Development, or Front-End Web Development (a separate report will be released for schools specializing in product development, data science, design, or marketing), and (d) based in the United States or Canada. Many schools offer courses at multiple campuses across a wide range of curriculum. Respondents were asked to only report on courses meeting the above criteria (full-time, in-person, non-accredited, programming-specific, United States/Canada). 2017 Forecast. All participants reported the number of students who graduated in 2016. All participants also provided estimates of their expected, 2017 graduate total. Course Analysis. In addition to survey responses, we utilized the Course Report database of individual course sections to identify a sample of 244 courses (used in Table 2 and Table 3). To qualify for our sample, the course needed to meet all of the above criteria and have a start date in 2017. 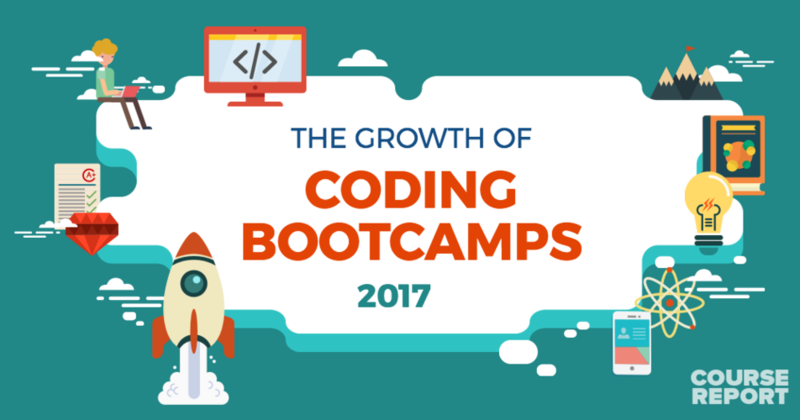 After surveying school representatives from the 95 qualifying US/Canada-based coding bootcamps, Course Report estimates a 52% growth rate for the coding bootcamp market from 2016 to 2017. Among the respondents, 15 schools reported “zero” graduates in 2016. That group expects to graduate 463 students in 2017. Among the 93 schools we surveyed, 86 schools expect to grow in 2017. The number of schools offering full-time programming courses in the US/Canada has increased from 91 in 2016 to 95 in 2017. This accounts for 6 schools that have closed for a number of reasons and 4 schools that no longer qualify for inclusion in this report (see more in Participating Schools). Tuition ranges from free to $24,000 for a course, with an average tuition of $11,469. Courses range from 8 to 104 weeks, with an average of 14.1 weeks, but most courses are in the 12-week range. Our study focuses on full-time programs, where students typically commit at least 40 hours per week, between classroom and programming time. Based on our estimate of 22,949 students in 2017, we estimate tuition revenue at $265,865,877 in 2017, excluding rebates and scholarships. Some schools also collect placement fees from employers for students accepting full-time jobs after graduation. Many schools offer job-placement rebates, ranging from a few thousand dollars to the entire tuition. Typically, rebates are offered to students who receive a qualifying job through the school’s job placement program or in the form of a money-back guarantee for students not placed in jobs. According to our 2016 Outcomes & Demographics Report, 5.1% of graduates receive a tuition reimbursement of an average of 44.5% of the tuition cost. In 2017, 10 schools offer Deferred Tuition. These are App Academy, Ada Developers Academy, Grace Hopper Program, Revature, Learner’s Guild, LaunchCode, C4Q Access Code, Cultivating Coders, Academy Pittsburgh, and Holberton School. Deferred Tuition refers to a payment model in which students pay the school a percentage (18% to 22.5%) of their salary for 1 to 3 years after graduation, instead of upfront tuition. Mobile Development coding bootcamps have historically been taught using Java (Android), Objective-C (iOS), or Swift (iOS). In 2017, 48% of Mobile Development bootcamps teach iOS with Objective-C (Chart 1b). This year’s market sizing includes bootcamps that provide coding-specific curriculum with a focus on Full-Stack Web Development, Mobile Development, or Front-End Web Development. Of these three career tracks, Table 3c shows the continued popularity of Full-Stack Web Development – 91% of coding bootcamp grads learn Full-Stack Web Development (Chart 1c). As of June 1, 2017, there are coding bootcamp campuses in 74 US cities and 40 states. The 2017 Market Sizing Study again includes Canadian bootcamps. These 7 Canadian bootcamps graduated 1,043 students in 2016, will graduate an estimated 1,304 in 2017 and will generate $13,599,015M in revenue in 2017. The most popular teaching language in Canadian bootcamps is divided evenly between Ruby on Rails and MEAN Stack. As of June 1, 2017, there are coding bootcamps in 5 Canadian cities and 4 provinces. Our 2016 Market Sizing Study projected the 2016 market size to be 17,966 graduates. Our 2017 study finds that the actual market size in 2016 was 15,077 graduates. Thus our 2016 report overestimated 2016 growth by 19%.